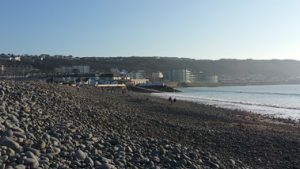 A guide to Westward Ho! Westward Ho! has rapidly become one of the U.K.s most popular family holiday destinations. Although a great holiday destination since the 1950’s, popular for families and surfers, recently Westward Ho! has undergone huge redevelopment with new restaurants and facilities. The promenade in Westward Ho! has changed dramatically, it used to feature The Bath Hotel also know as as The Golden Bay Hotel, an imposing building that was built in 1864, close to the Westward Ho! railway station. The Promenade now features new apartments, bars, toilets, convenience stores, beach shops restaurants and so much more family friendly facilities and attractions, all within a few steps from the beach. Westward Ho! beach is an award winning blue flag beach that offers magnificent views of Northam Burrows all the way along to Saunton with views of Lundy Island on clear days. Backing on to the beach is Pebble Ridge which is part of Northam Burrows featuring over 253 hectares of unspoiled coastal plain, sand dunes and grassland. This rural park is open to pedestrians with parking for restricted vehicles. 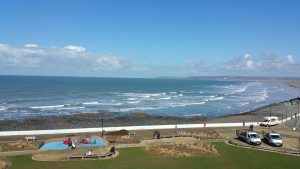 Family and pet friendly venues on Westward Ho! Whether you’re looking for something to eat or something to do for the family look no further! When it comes to dining you will be spoilt for choice. A family friendly establishment offering an extensive choice of beverages with a menu to match. Rain of shine The Waterfront is the place to go featuring pool tables, purpose built soft play area called Nippers for the little ones including 2 gardens. The Waterfront is conveniently situated just meters from the beach. The Pier House is bar and bistro offering a superior dining experience complemented by a highly skilled team of individuals. A well stocked bar features an endless array of premium spirits and local beers. The most notable pert about The Pier House is it’s views, simply breathtaking! Recently refurbished, The Pier House features a two tier decked terrace, just 3 meters from the rural coastline, if you want to see North Devon at it’s absolute greatest, The Pier House is where to it. Sit down with a chilled glass of wine or coffee and watch the world go by. If you want to take your dog away this summer or winter there’s no better place than Westward Ho!. 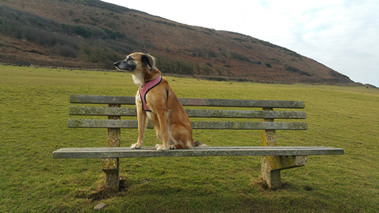 At Braddicks we offer dog friendly holidays, tailored to suit you and your pets from the accommodation to activities. Each dog friendly property features it’s own private pet area, secure giving you pure peace of mind and giving them the freedom they need. When it comes to adventure, why not set of for a walk, you can choose the terrain as there’s plenty of it. Just meters from Braddicks pet friendly holidays is the main coastal path, also known as the Tarka Trail. Set off on a walk to explore the North Devon countryside in it’s raw beauty, away from roads and the hustle and bustle. If you’re looking for something a little more challenging take a hike across the many landscapes Westward Ho! has to over to see even more incredible views.